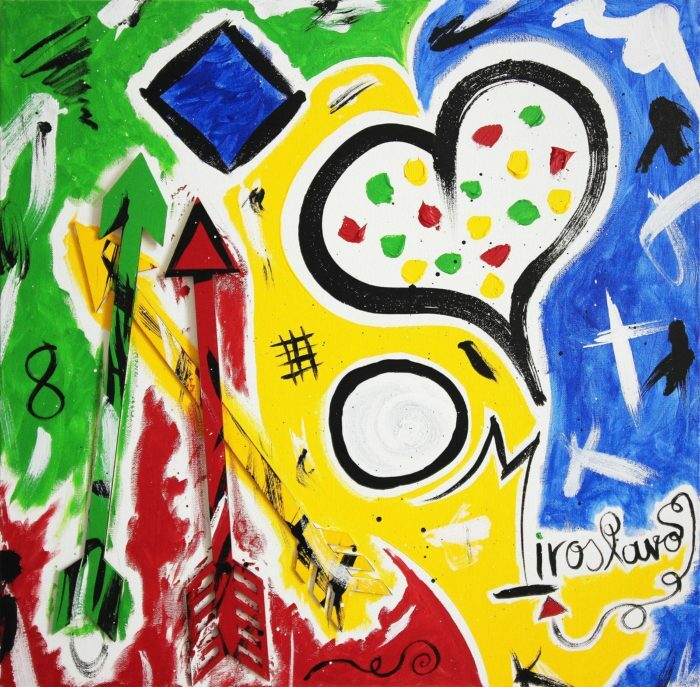 This canvas painting uses my traditional symbols, shapes, and colours to explore the concept of love. When you open yourself to love, you are ultimately sharing your emotions and thoughts with another person. Yes, it’s beautiful and rewarding, but it can also bring a lot of difficulties since there is a saint as well as a devil inside each of us. The closer you are to a person, the more love and pain you are able to experience. That’s what the arrows represent in this painting, the vulnerability that love creates and makes us experience this amazing gift to the fullest. We can conclude that we must respect love to sustain its presence in our lives.